In a perfect world, not only would I see every film on the big screen but I would know absolutely nothing about them beforehand. Once in a while I am reminded that the best way to see a movie is with no foreknowledge whatsoever as to the film's genre, cast or plot. To go in having no preconceived notions about how one ought to feel or what one ought to think about it — no expectations for how impressed one is supposed to be by the performances, sets, costumes, budget, etc. — but to simply approach the work on its own terms and be either carried away by the reality it creates for itself or be alienated from that reality based solely on the competence with which it weaves its tale would be my ideal. Of course, I realize that we do not live in such a world. Even if it were possible to see every film in the theater (which, for many people it is not, due to physical limitations or economic difficulties) I'm not sure I'd want to given how awful so many movies are nowadays. If I could somehow be guaranteed ahead of time of a film's quality, I'd be willing to go into every film-viewing experience completely "pure" and uncorrupted by any outside information or influence. As it is, I can recount the exact number of times I went to a movie under such circumstances. It has happened precisely twice. The first was The Fisher King. The second was The Usual Suspects. Since the former celebrates its 20th anniversary today, it is that title with which I will be concerning myself. 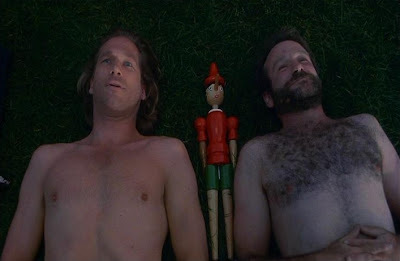 My dad took me to see The Fisher King when I was 15 and, as I've said, I knew very little about it outside of its enigmatic title and the fact that it starred Robin Williams and Jeff Bridges (a fact I was able to glean from the marquee poster on the outside of the theater). I had no idea that the story involved a cynical, egotistical Manhattan radio "shock jock" named Jack Lucas (Bridges) whose careless on-air remarks prompt a disturbed caller to open fire with a shotgun in a restaurant full of yuppies before turning the gun on himself. Racked with guilt, Jack descends into a deep depression and alcoholism for three years during which time he shacks up with a self-assured New York woman named Anne (Mercedes Ruehl) who owns a video store. On a particularly bleak night, Jack attempts suicide but two young hoodlums who find him and start pouring gasoline on him intending to set him ablaze interrupt him when he is saved by Parry (Williams) a homeless man who believes he's a knight sent on a quest from God to find the Holy Grail. Jack soon learns that Parry's insanity stems from his traumatic experience in the restaurant the night of the shooting when his wife was one of the seven people killed. Feeling responsible and, in a desperate attempt to ease his conscience, Jack resolves to help Parry in some way and thinks he may have discovered how when he notices Parry pining from afar for a mousy woman named Lydia (Amanda Plummer). I didn't know any of this going in. Despite (or perhaps because of) my ignorance of the film prior to seeing it, I was positively captivated by it from beginning to end. Somehow it weaved a magical spell over me. As the cliche goes, I had never seen anything like it before. It quickly became my favorite film and remained so for a couple of years. I bought the soundtrack, which featured segments from the wonderful score by George Fenton, and even found a copy of the novelization to help enrich my understanding of the story and its themes, all of which resonated quite strongly with me: love, loss, forgiveness and especially redemption. I also did not know who Terry Gilliam was. 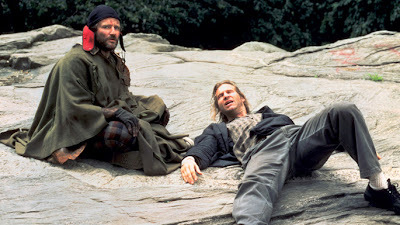 I didn't even really know about Monty Python yet, so I certainly didn't know that The Fisher King wasn't his first cinematic foray into the subject of the Holy Grail (though I was at least acquainted with the Grail having seen Indiana Jones search for the thing two years prior). I didn't know that this was a rare occasion where Gilliam, who normally writes his own screenplays, was really a director-for-hire. After the debacle that was The Adventures of Baron Munchausen, Gilliam was looking for a smaller and more intimate story to tell and he found it in the unique and spellbinding screenplay written by Richard LaGravenese (who would go on to pen The Ref, Beloved and The Bridges of Madison County). Interestingly, when I watch the film now — having seen the rest of Gilliam's oeuvre and being a big admirer of his work — it seems like a project tailor-made for Gilliam and his personal pet interests such as reality versus fantasy, imagination as an escape from tragedy, medieval knights in shining armor, etc. The film is filled with dozens of entrancing and unforgettable scenes. The sweet and hilarious double date that begins with Lydia clumsily knocking things over (with Parry doing the same in an attempt to make her feel less awkward) and ends with everyone in hysterics before Williams sings a sweet and simple rendition of "Lydia the Tattooed Lady," the frightening chases involving the Red Knight, the climactic sequence where Jack attempts to retrieve the Grail from its "castle" (all the while commenting to himself on how crazy it is), the nightmarish flashbacks to the murders at the restaurant and Michael Jeter's audacious Ethel Merman-style musical number delivered to a flabbergasted Lydia are just a few. 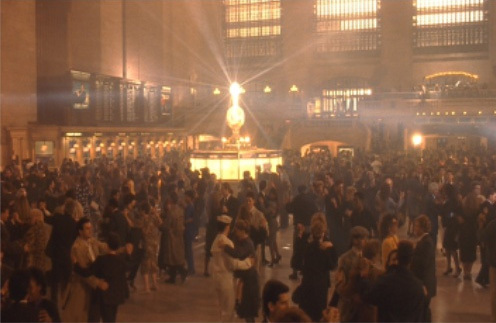 However, my all-time favorite sequence from the film occurs in Grand Central Station. It begins with Parry looking through the crowd for Lydia. When he finally glimpses her, he smiles and the music starts. She walks right past him and suddenly a couple dances by in the background as the cute little ditty that was playing transitions into a beautiful waltz. Soon that couple is followed by another and another until everyone in Grand Central is waltzing around Parry as he follows Lydia across the floor. It's a charming sequence and apparently was not in the original script but was the brainchild of Gilliam, who needed a way to visually capture how bewitched Parry is with his fair maiden. It's sublime. The performances by all the actors are excellent. 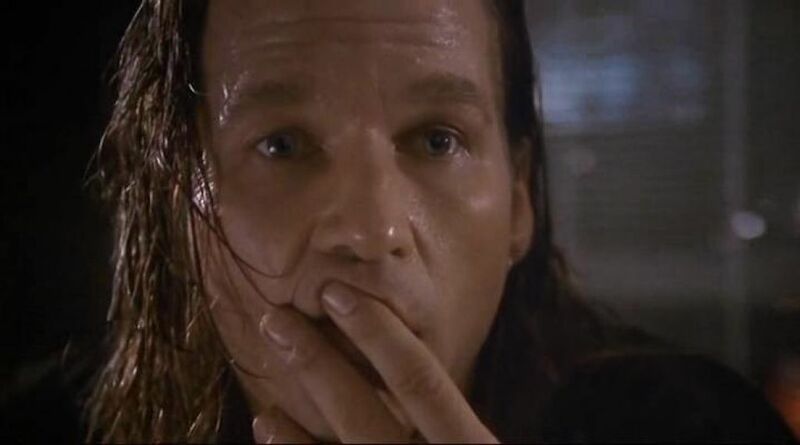 Jeff Bridges may be enjoying somewhat of a rejuvenation in his career currently, but at the time of The Fisher King he was just another solid, respected but somewhat underrated actor (like Johnny Depp before Pirates of the Caribbean or Robert Downey Jr. before Iron Man). His portrayal of the selfish, cynical jerk is actually the emotional anchor of the story. He's the straight man off of whom Williams can play his performance as Parry, a variation on his usual manic screen persona, though here it is put to good use in the guise of an insane, but brilliant, former history professor who even in madness has an entire library of references from which to draw upon in his ravings (one can almost imagine that had Williams' character from Dead Poets Society lost his mind, the results might look something like this). What makes Williams' performance superior to his usual fare are the quieter, more sensitive moments such as when he finally confesses to Lydia that he loves her. Williams earned a best actor nomination for his turn as Parry, but alas he would not receive that Oscar until years later for his stellar supporting work in Good Will Hunting. Mercedes Ruehl, however, did take the best supporting actress statuette home that year for her indelible turn as Jeff Bridges' sassy girlfriend and it was well-deserved. She embodies the self-assured, no-nonsense New York Italian woman perfectly. Amanda Plummer plays Lydia with just the right amount of sweetness and eccentricity and the late Michael Jeter as a gay cabaret singer does what is perhaps the best Ethel Merman impression I've ever heard in a film (except perhaps for Lt. Hurwitz in Airplane!). Also, David Hyde Pierce, Harry Shearer, Kathy Najimy and John de Lancie all play supporting roles. Generally speaking, The Fisher King was well-received by critics and did respectable business at the box office (making $42 million on a $24 million budget). In the 20 years that have elapsed since I first walked into that theater completely unaware of what I was about to experience, other films have gone on to replace it as my "favorite," but it will always have a special place in my heart. Its story still moves me, its music still delights me, its action scenes still thrill me and its characters still charm me. To this day when I watch it I want to believe that Parry is not totally crazy, that he really is "the janitor of God" and that the chalice they retrieve truly is the Holy Grail, "the symbol of God's divine grace." It may not be Terry Gilliam's best film (I tend to be unoriginal and go with Brazil on that point) but it is probably his most enchanting and more than any other film, shows off his gift as a romantic, honest-to-God storyteller and not just an eye-dazzling satirist/rebel.